On Wednesday, September 14, 2011 the first 1,000 bike shops to present a CycleAware Wingman coupon to CycleAware booth #4103 will receive a free Wingman rearview mirror ($18 MSRP). 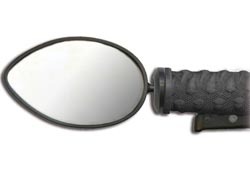 Wingman, the new bar end mounted bike mirror, is the latest addition to CycleAware's line of innovative, high-end "see and be seen" bicycle accessories. Wingman is closely related to CycleAware's new Urbie bar end mirror -- both mirrors share the same high-quality glass mirror; however, Wingman is made for cyclists riding in a more downward position, who need a mirror at handlebar height, while Urbie has a riser bar that allows for a more upright riding position. Wingman's rubber insert fits inside any flat handlebar, so by simply pushing the Wingman inside the insert, it is installed. When Wingman is not needed it can be easily removed from the rubber insert that also acts as the bar end cap. Lee Gilbert, CycleAware's President and CEO explained, "Cyclists who put a high priority on being aware and in control on the road instantly see the value in using a CycleAware mirror. Increased safety and confidence gives you a competitive edge - whether you're racing or just competing for space on the road." Erin Lee, CycleAware's marketing coordinator commented, "We're excited to have 1,000 bike shops leaving Interbike with a new Wingman. It's a great opportunity to let cyclists experience how enjoyable, and simple using a CycleAware mirror can be." IBD's attending Outdoor Demo will receive a free CycleAware Stow-Away backpack, inside of which they will find their coupon to redeem a free Wingman at CycleAware's booth# 4103. Additionally, IBD's can obtain a coupon online at CycleAwareB2B.com by clicking the "Free Wingman" button, or by clicking on CycleAware's "Free Wingman" offer at Interbike.com (Limit 1 coupon per bike shop location). U.S. retailers can purchase CycleAware products from the following North American distributors: QBP, SBS, J&B Importers, Wilson, Trek, Raleigh, Hawley, Lexco, Olympic Supply, Cyclone and Norco. Wingman is currently available in bike shops, outdoor sports stores and online at www.CycleAware.com. International distributers are listed at www.CycleAwareB2B.com. In addition to Wingman, CycleAware is the manufacturer of eleven other innovative sport "see and be seen" products including six mirrors and five visibility products. CycleAware, Inc. markets its products internationally and is the world's leading high-end cycling mirror manufacturer. CycleAware's mission is to provide top quality, innovative accessories to a wide variety of cyclists and action sports enthusiasts worldwide.